Tides are changing, so to speak, in two major food trends. To start, more consumers are adding seafood to their plates. Technomic’s 2017 Center of the Plate: Seafood & Vegetarian report found that 53% of consumers eat seafood at least once a week, with 89% eating it at least once a month. Meanwhile a significant segment of consumers (67%) say they are more likely to buy seafood that is sustainable, and 30% say they are willing to pay more for it. Second, consumers are increasingly aware of the benefits of produce that is sourced locally—fruits and vegetables taste fresher and it aligns with consumers’ desire for sustainable options. This spells opportunity for operators: According to Technomic’s report, 70% of consumers say they are more likely to buy vegetarian options that are locally sourced, with 40% saying they’d be willing to pay more for it. Capitalizing on these waves of consumer preference, foodservice operators can combine sustainable seafood with local produce by using speed-scratch cooking, a low-labor solution that combines fresh ingredients with minimal preparation. 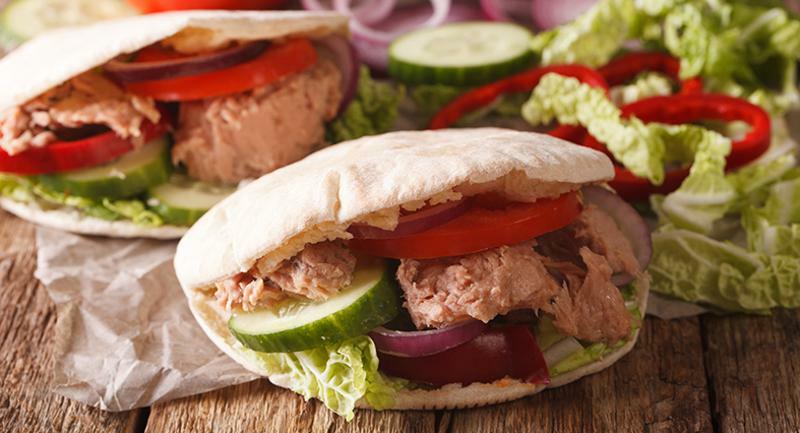 Here are four simple and healthy recipes to incorporate into your foodservice menu planning, whether you’re running a cafe, dining hall, hospital cafeteria or any other kind of operation. By combining fresh, local produce with clean-label ingredients, foodservice locations can quickly produce appetizing meals that deliver on wellness and sustainability goals. 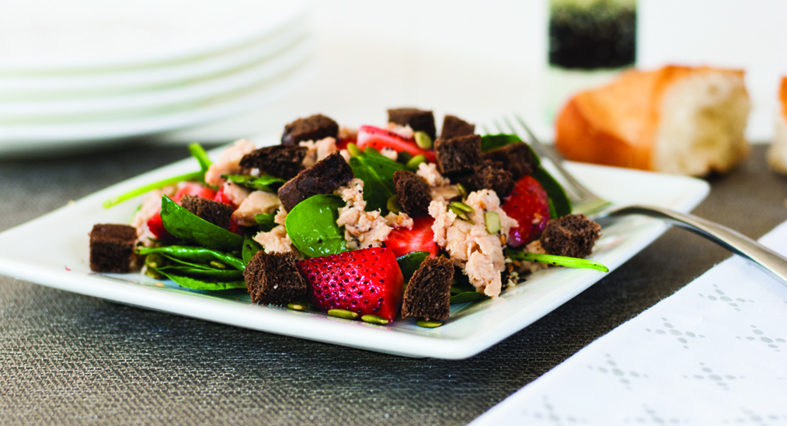 Consider adding Spinach Strawberry Salmon Salad to your menu rotation. Fresh baby spinach is tossed with quartered strawberries, then dressed with white vinegar, sugar, salt, black pepper, poppy seeds and salad oil. Before serving, garnish each salad on demand with more strawberries, pumpkin seeds and drained wild-caught pink salmon. Another tasty salad that is both quick to prepare and includes sustainable seafood with local produce is the Heirloom Tomato and Tuna Salad. 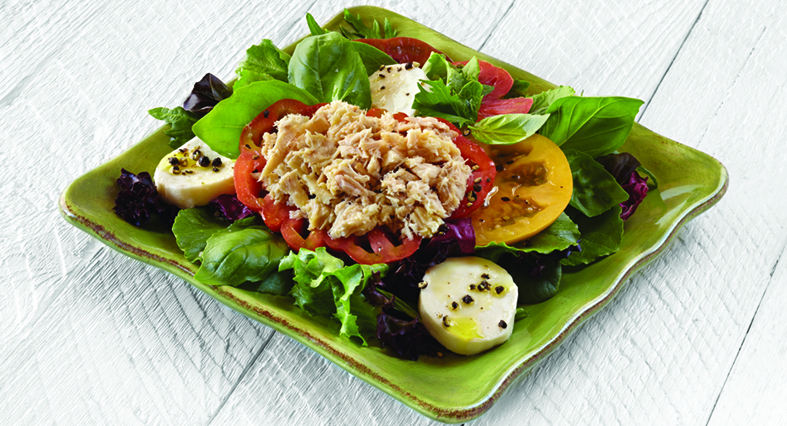 In this protein-rich salad, a bed of fresh mixed baby greens is topped with sliced heirloom tomatoes, mozzarella cheese and white albacore tuna. To finish, sprinkle with basil leaves and dress with olive oil, salt and pepper. Keep patrons’ interest high by creating variations with any combination of whatever vegetable is in season, such as steamed asparagus, snow peas or green beans. 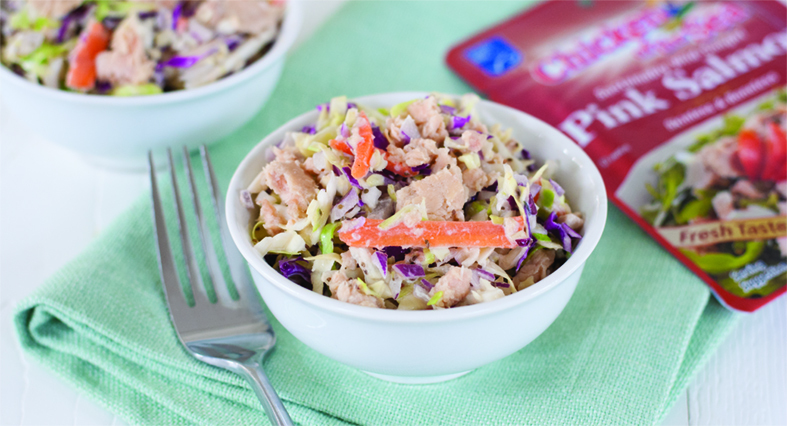 Slaw goes from side dish to the main event with the addition of salmon. First make the dressing by mixing mayonnaise, lemon juice, sugar, celery seed and Dijon mustard. Next, toss together shredded seasonal vegetables such as beets, broccoli, kale, carrots or cabbage with the prepared dressing, red onion or scallions and boneless, skinless pink salmon. Before serving, garnish each bowl with seasonal minced herbs (chives, dill, parsley, savory) and chopped seasonal vegetables (radishes or cucumbers). As a bonus, this recipe can showcase local produce currently in season. Low-carb diners will love frittatas, which can serve as the base for multiple protein and produce options. Operators can test the waters by offering this Herbed Salmon and Asparagus Frittata. First, prepare the fresh asparagus by trimming, slicing and steaming until tender. Beat eggs with skim milk and pour into an oiled pan to begin cooking. 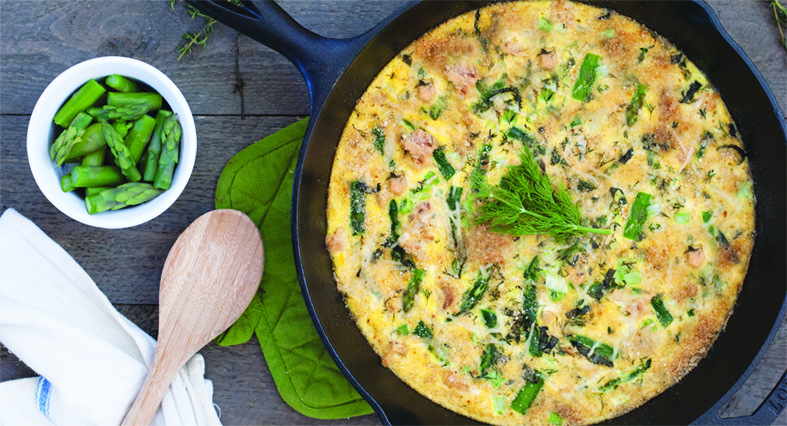 Before the frittata completely sets, add sliced green onions, boneless, skinless pink salmon and asparagus pieces across the top; then sprinkle with fresh herbs (parsley, dill, thyme and basil), shredded Parmesan cheese and bread crumbs. Finally, transfer the pan to the oven at 450°F to cook for two minutes, until the frittata is firm.